Father Kentenich was born in Gymnich near Cologne, Germany on November 18, 1885. He began his priestly life as a gifted teacher and educator in the Pallotine House of Studies in Schoenstatt, Vallendar. An extraordinary bond of trust developed between him and his students. They made his love for Mary their own and through his message learned to see her as a bridge leading to a deep, fervent love of God. Alert to the signs of the time and listening attentively in order to perceive God’s will, Father Kentenich – together with a small group of students – entered into a covenant of love with Mary in the chapel (now known as the Original Shrine) at Schoenstatt. This was the beginning and the lasting foundation of today’s worldwide development of the Schoenstatt Movement. 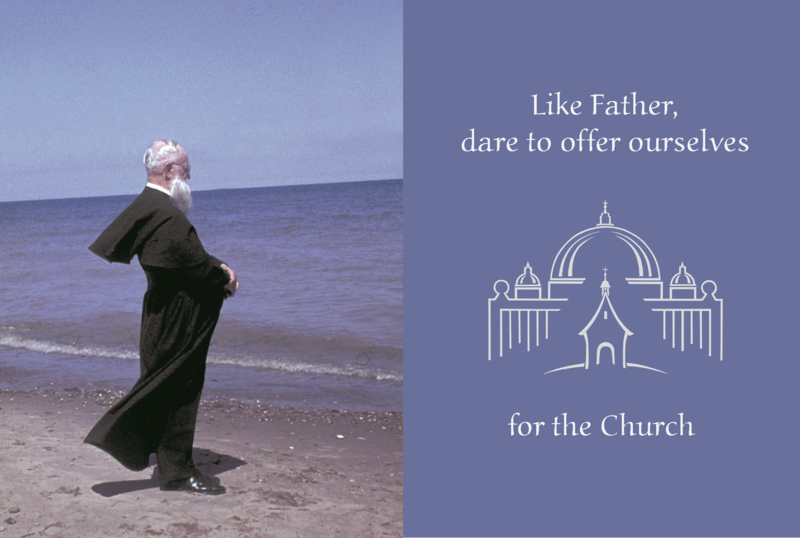 Throughout his life as founder, Father Kentenich gave his followers a deep experience of God’s fatherhood and led them into his own profound love for the Church. On September 15, 1968, the Feast of the Seven Sorrows of Our Lady, immediately after celebrating the holy sacrifice of the Mass, Father Kentenich was called home to the Heavenly Father. At his request, the words Dilexit Ecclesiam (He loved the Church) were inscribed on his tomb. © 2019 Schoenstatt Movement. All Rights Reserved.